It was the year of mobile in 2013. Globally, more than 100 billion mobile apps were downloaded in this year, with revenues from apps touching approximately $26 billion. It is an increase of 44% compared to 2012, when 64 billion apps were downloaded, generating revenues of $64 billion. Android and iOS apps accounted for nearly 90% of total apps downloads. 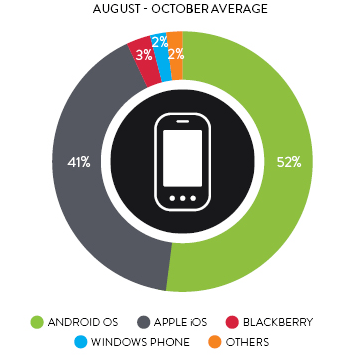 Android accounted for 52.2% of all downloaded apps, while iOS had 40.6% share. India is yet to reach that fanatic levels of app download, as only 15% of Indians with smartphones have ever downloaded an app, with 90% among them choosing the free version over paid. Currently, Indians downloaded approximately 1.56 billion mobile apps in 2013, which is expected to touch 9 billion by 2015, if the downloads grow at a speed of 75-80% year on year. Facebook with 1 billion+ users of its website was the most popular mobile app in both Android and iOS platforms. Facebook mobile app is being currently used by over 103 million users, and the usage pattern witnessed an increase of 27% compared to last year. Google search app comes by default on Android powered devices, and is available on iOS as well. 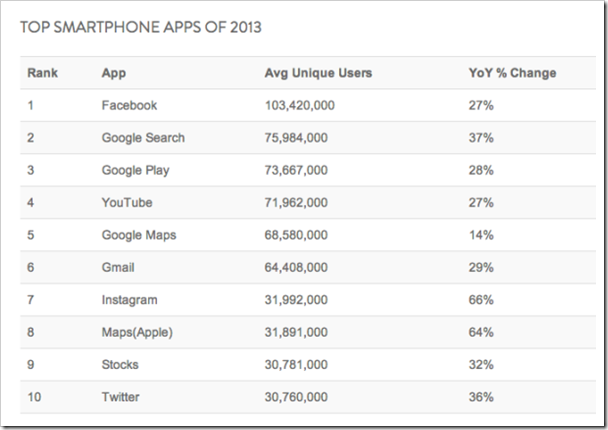 With 76 million users of Google Search app on mobile, it is 2nd most popular app of 2013. The popularity increased 27% compared to last year. If you want to search and install any app on Android platform, you will need Google Play app. And this essentiality of all Android powered devices propelled this app to rank #3 in 2013. A total of 73 million+ smart phone users have installed this app as of now, and compared to last year, it’s usage increased 28%. With 71 million smart phone users, Youtube mobile app is ranked #4 in overall popularity and usage of mobile apps. This is hardly surprising, considering that Youtube is now world’s second biggest search engine after Google! Compared to last year, the usage of Youtube app increased 27% in 2013. Although Apple has launched it’s own map application, Google Maps continues to be the favorite one for most of the smart phone users. With 65 million+ users, Google Maps is the 5th most popular mobile apps for both Android and iOS platforms. It’s popularity increased 14% this year, compared with 2012. Gmail has once again proved that it is world’s best email platform. Gmail mobile apps has a total of 64 million users and it is ranked 6th most used mobile app for 2013. It’s usage and popularity increased 29% compared with last year. Facebook owned Instagram has a total of 32 million users as of 2013, and it is ranked #7 in the overall ranking of most popular mobile apps. It was the fastest growing mobile app in the year 2013, as its popularity and usage increased by staggering 66% this year compared with last year. More and more teens are ditching Facebook and joining Instagram to share their intimate images with friends and family. Apple Maps is slowly inching towards Google Maps, as it was the second fastest growing app in 2013. With 31 million users as of now, Apple Maps has grown 64% this year, compared with 2012. It is ranked 8th most popular mobile app for 2013. Stocks app was 9th most used mobile app for 2013. With 30 million smart phone users, Stocks was the most popular Financial app. Its popularity increased 32% this year, compared with last year. Twitter has 30 million+ users as of now, and this makes it the 10th most popular mobile app for 2013. Its popularity has dipped a bit, as it increased 36% compared with 2012. So, which were your favourite apps for 2013?